US Navy/Andy WolfeAn F-35 Lightning II Carrier Variant (CV) piloted by U.S. Marine Corps Maj. Robert ‘Champ’ Guyette II, a test pilot from the F-35 Pax River Integrated Test Force (ITF) assigned to the Salty Dogs of Air Test and Evaluation Squadron (VX) 23, flies over the stealth guided-missile destroyer USS Zumwalt (DDG 1000) as the ship transits the Chesapeake Bay on Oct. 17, 2016. 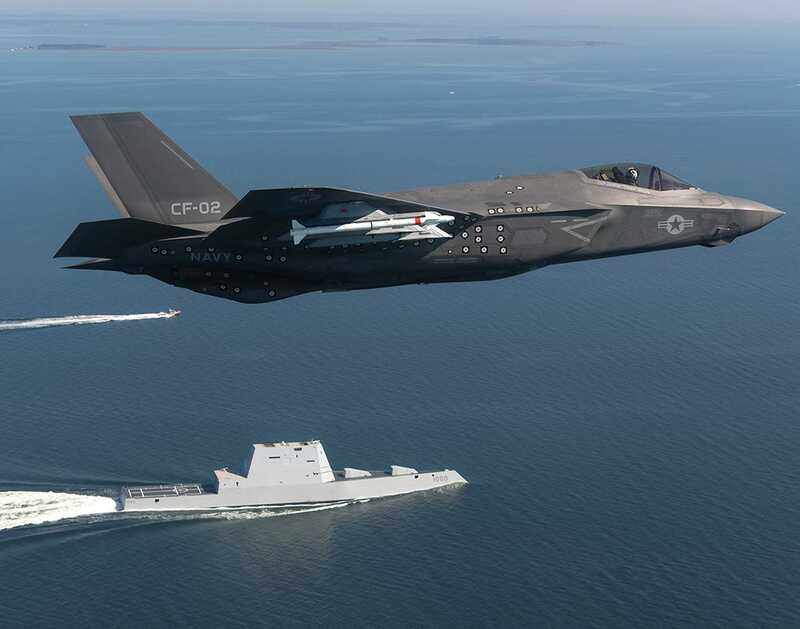 In the above picture we see just one large boat, the USS Zumwalt, and just one plane, an F-35C, but that’s likely all the US Navy will need to dominate the seas in the future. Despite being the US Navy’s largest-ever destroyer, the USS Zumwalt is a ship so stealthy that it appears as a small fishing boat on enemy radars and sometimes has to deploy mirrors to make it more visible to friendly traffic on the open ocean. “If Batman had a ship, it would be the USS Zumwalt,” Adm. Harry B. Harris, Jr., commander of the US Pacific Command, told CNN. Both the Zumwalt and the F-35 share one key concept of the Navy’s vision looking forward — modularity. With a large rear flight deck and a oversized power plant, the Zumwalt can accommodate weapons of the future like lasers, railguns, and the F-35B short takeoff variant. The F-35 has options too. It can deploy with a detachable gun pod, it can carry external ordnance on pylons under the wings, or go out in full stealth mode with only the bombs in the internal bay. Together, the Zumwalt and the F-35 can achieve things that would have previously taken entire fleets and months of planning to do. The F-35 can talk to the Zumwalt and have the ship fire missiles at targets marked from the plane. The F-35 can also command fleets of drones to do it’s surveillance and firing for it. The Navy of years past imposed its will with massive fleets of battleships billowing smoke, but tomorrow’s Navy will use surgical, stealthy tools to get the job done with just a few ships and hardly a blip on the radar.